One of the oldest sweet food in the world is ice cream. It is the most beloved dessert and one food that we can eat even when we are already full. It does not only provide refreshment but also comfort us when we are down, upset, not in a good mood, or having mood swings. It comes with a lot of flavors—vanilla, chocolate, cookies and cream, strawberry, mango, moose tracks, cookie dough, and a lot more. Each company manufacturing or selling ice cream has a variety of flavors that its customers can choose from. So, if you got a lot of flavors offered, it is important that you inform your customers regarding the available flavors with the use of an ice cream menu. 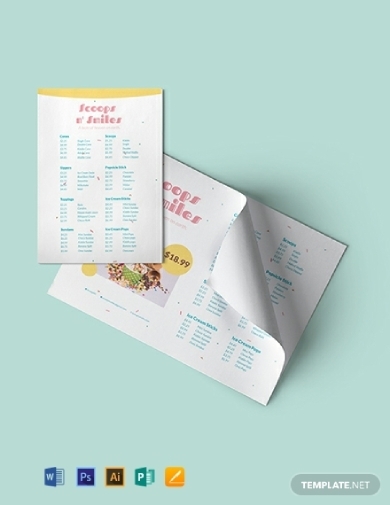 A menu is not only for providing a list of the flavors but also for launching the company’s branding. 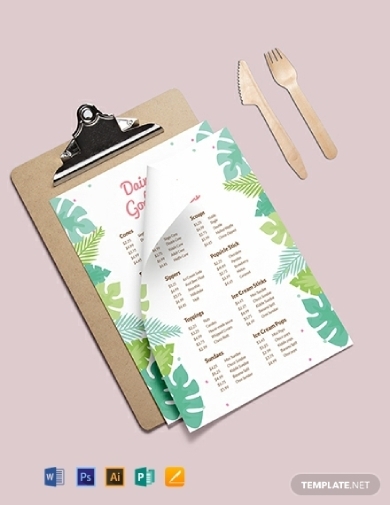 Here are menu templates and examples that you can use whenever you have decided to create an ice cream menu for your company. Wanted to have an increase in your business profit? Apart from working on your marketing strategies, you must also put extra effort into your advertising materials, such as your flyers, brochures, posters, and, of course, menus. 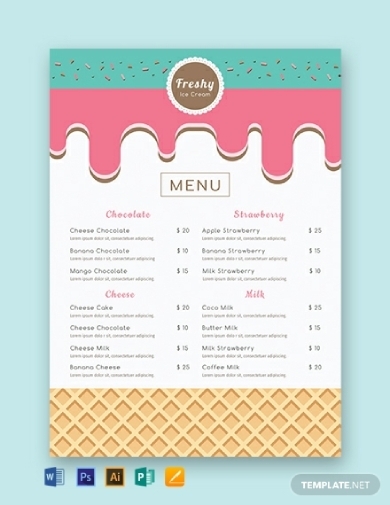 With the use of this modern ice cream menu template that is created by professional designers and graphic artists, you are guaranteed an excellent design since this contains high-quality graphics and useful contents that is very easy to edit and customize according to your specific preferences. This can also be easily downloaded and printed, hence very convenient for every user who wants to immediately create a menu for his or her ice cream business. If you want to stand out and stay on top of the competition, this creative ice cream menu is perfect for you. We understand and know the hassle of starting from scratch, so we offer you this template that you can easily customize and personalize so you can incorporate the personality and branding of your company. Apart from the list of the available ice cream products that you are offering, you must also include your company information, such as the business name, company logo, and other branding elements. Additionally, do not forget to include your contact details, such as phone number, email address, website, and social media account in case there are people who have questions, feedback, orders, and other concerns regarding your business. With the use of this basic ice cream menu, you are guaranteed a professional and presentable menu template that you can easily download and edit. You can incorporate your personal or corporate branding designs and include the necessary information that concerns your target market, such as the variety of ice cream that you are offering, the price for each product, and a short description for each one. When you are writing the description for your ice cream, do not forget to use words that are proven effective in marketing, such as fresh, great, best, high quality, save, and a lot more. 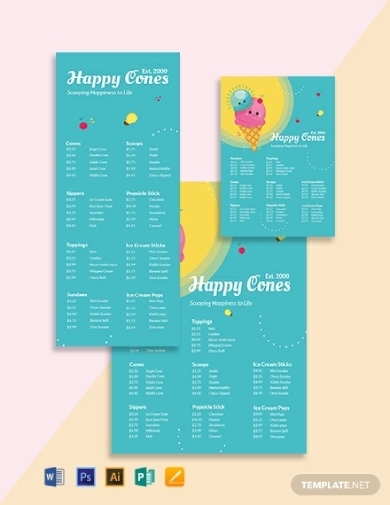 For artistic people who wanted to make their menu as aesthetic as possible, this ice cream menu template would surely satisfy their preferences. The graphics and other design elements are in high quality, and the illustrations are incorporated in the design neatly, making it more attractive and appealing to the readers. This template is very convenient to use whether you are a beginner or a pro in graphic designing since it can be edited using software applications that can open Illustrator, Photoshop, MS Word, Publisher, and Apple Pages file formats. With the increasing demand for ice cream nowadays, more and more business entities offering ice cream have emerged to answer this demand. Hence, there is a tight competition among ice cream suppliers, providers, and sellers. In order for a company to survive despite the tremendous competition, it must exert more effort in their marketing tools, which includes the menu for their products offered. 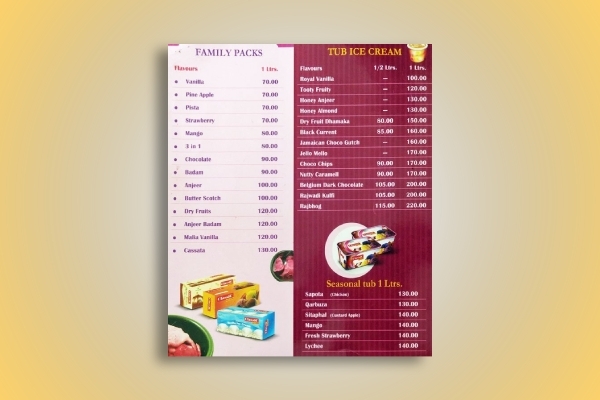 Just like in this classic ice cream menu example, it not only is visually pleasing but also contains a complete list of the varieties of ice cream that the company is offering. Hence, you must know how to balance the aesthetic and functionality of your menu. 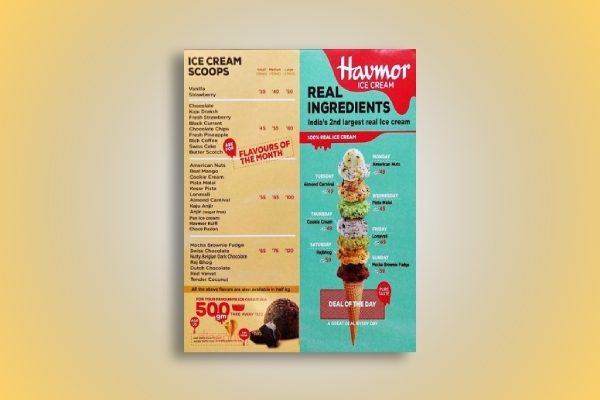 A menu is one way of bragging your great offers to your customers and prospects so they will be interested and attracted to your ice cream products. Apart from your list of ice cream flavors, it is more appealing when you also include excellent graphics of your ice cream so that people will have an idea what your ice cream looks like and, from there, imagine what it tastes like, making them more curious to try your offer. 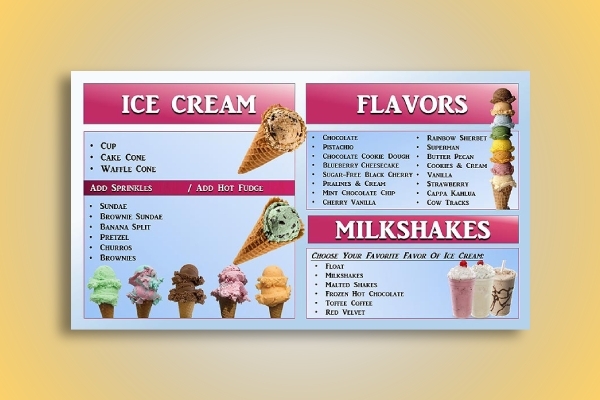 In this ice cream and milkshake menu example, presented are the different flavors of ice cream and milkshakes that are available for purchase. It also contains a list of their flavors offered as well as photos of the different flavors. So when you create your own dessert menu, remember to include your company branding apart from your list of ice cream flavors in order to cement a name in the industry and make your brand known to the market. The more people will be familiar with your brand, the more they will trust in your credibility.